G4 Cube, Pismo, Blue and White G3 (at work) are my machines. My wife is using a 1st gen flat panel iMac. 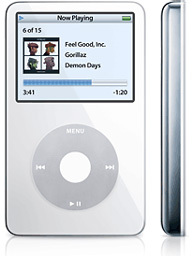 We use a 3Gen iPod for day to day musicking and backups. Trouble is, I just sold it to raise cash for a video iPod. With hindsight and further reading I find that the new iPod does not support FireWire at all. Now I can get a card for my Blue and White, and my wife's iMac has USB 2.0... The other machines seem to be out in the cold, especially the Cube. Are there options for connectivity to my Cube and Pismo? Is there such a cable to do FireWire 400 on one end and USB on the other? Will a 3rd party USB 2.0 card work with iTunes in the Pismo and the B&W? If such an inline adapter exists, it has eluded my attempts at detection. I can't say for 100% sure, since I haven't tried it, but I'm pretty confident that you should have no problems connecting your new video iPod to CardBus and PCI adapter cards on the Pismo and B&W respectively. However, it isn't looking good for the Cube. 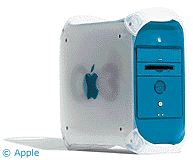 I remember that one of the objections to the Cube back in 2000 was that it had no PCI slots. The same dilemma obtains with my G3 iBook, which has no PC card slot and only USB 1.1. I recently bought one of those old 'toilet seat' iBooks cheap on eBay so I could throw it in a suitcase (I do a lot of traveling). A lifetime PC guy, I always wanted a Mac, and since I'm a musician, all my friends have them. My question is this: It has OS 9.2.1 installed, 512 MB RAM, and a 6 GB hard drive. Is there any reason that I can't install OS X? Most of the open source software that I've been using on my PCs lists OS X as a Mac requirement. Does that mean that they won't support older systems, or that they won't work on older systems? Or maybe OS X won't recognize older hardware? Sorry, but I'm new to Macs. You can certainly install OS X up to version 10.3.9, which is what I would recommend. You didn't say which clock speed your iBook is, and if it happens to be one of the last generation clamshell machines equipped with FireWire, it is also supported by OS X 10.4, but I would still recommend 10.3 because it places less demand on your processor and video support, which is not that powerful in any clamshell iBook. Even with OS X 10.3, you will notice a significant degradation in Finder response and screen redraws, etc. compared with OS 9. However, you may find the extra features and more contemporary software compatibility of OS X justifies the performance hit, and in any case you can still boot into OS 9 anytime you like. Both operating systems can coexist happily on the same hard drive. Not much software is still being developed for OS 9. I would also suggest updating to OS 9.2.2, which is a free update from Apple's support site. I've enjoyed reading your column over the years. Thanks for your useful insight, information, and links. I'm hoping that you might at least point me in the right direction here. I have had an ailing Pismo 400 for about five years now (it took a massive fall out of my unzipped briefcase early in its life). It would run fine for days, months, etc. - but only if I kept it as a desktop machine. If I moved it, the machine often simply froze. Or, if I moved it while it was asleep, it would never wake up. After starting it up (Tiger), I logged in and started up iTunes. After a while of streaming, it froze. So when I went to restart as normal, it restarted - but no boot chime: only three short sine wave tones. The HD has spun up, but the screen remained blank. I pulled the battery, adapter, reset the PRAM, pressed the reset button in back - all to no avail. On startup I still get only the three short sine wave tones - bummer. Couldn't find any resources on the net about these tones or what it means, and I haven't had the time to check the memory, daughtercard, etc. Has my Pismo gone the way of the Dodo? I'm hoping that someone might be able to tell me what the short tones mean, so I can at least know where to start looking. I can't tell you offhand exactly what the tones signify, but it's not anything good. My inference is that it means some sort of hardware malfunction, possibly bad RAM, or more likely in your case a motherboard damage issue or perhaps a loose connection. The heatsink retainer may not be the only thing that got cracked in the accident. FWIW, my WallStreet behaved much as you describe when its processor died, although I don't recall if there were tones involved or not. Tough to diagnose when the machine won't boot. I would say that a 400 MHz Pismo does not merit spending serious money on. Looking for another used Pismo and use yours for a parts mule. On your article of Oct. 11 you had input from M.D. regarding screen orientation. It seems that with 10.4.0 & 10.4.1, you can use opt-click on Displays to activate a Rotate option. It is unclear if it is available at all in 10.4.2. 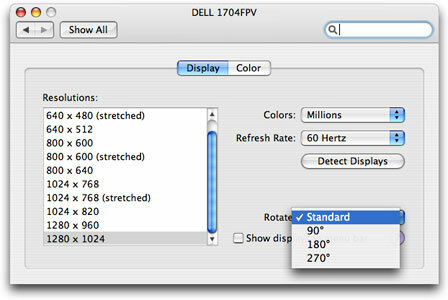 I first came across this when investigating the Dell 2005FPW 20" widescreen, rotatable, Mac compatible, display. It also has DVI + VGA + composite inputs, perfect for combined Playstation and two computer use! Also it only costs £356 (UK) or $699 (US) - a really good price, unusually cheaper in the UK than the US! The one drawback is the viewing angle is only 88 degrees, far far worse than the Apple screen, but the Apple screen has only DVI (I want composite too), and it does not rotate. I hope Apple do rotation officially soon and provide composite input. Thanks for the information, Tim. I hope so too. The difference between a 720K and an 800K floppy is that on a 720K floppy the sectors are written "CAV" (Constant Angular Velocity) style. That is to say that the closer you get to the edge of the disk, the less dense the data becomes. The drive spins the disk at a constant rate, leaving larger gaps between each sector the further you are from the middle of the disc. This is the cheapest way to make floppy drives, as you only have to spin the disk at a fixed speed. 400K and 800K drives use CLV (Constant Linear Velocity) to slow down the disk the further from the middle you are when reading or writing data. This allows the data to be more tightly packed but only works in drives that support it. You may also recognize the terms CLV and CAV from Laserdiscs days - same concept there. Oh, and in case you were wondering, the 2.88MB floppy drives seen briefly in some IBM branded PCs used special floppy disks that were a higher density but were still CAV. Thanks for the information, Steven. Your memory is good - there are some potential gotchas with the tape trick. One is simply that the tape has a habit of coming off and gumming up the works. The other is that 1.4MB and 400K/800K media don't have quite the same magnetic properties, so there's a risk of unstable data. The problem is less severe if the 1.4MB floppy has never been written on (this includes formatting). A bulk eraser would do the job, but not erasure with a floppy drive. But all that is unnecessary in most cases anyway. Just get ordinary 720K PC floppies (still widely available) - they are the same thing. Reformat as Mac, and you're good to go. Thanks for filling in the blanks in my recollection. I knew there was some issue that made the tape kludge less than desirable. I have Redux version 2.51 and have noticed that it appears to have a Y2K problem with dates in the script. Do you know if there is a newer version still available? I haven't heard anything about Redux for quite some time, and Google didn't turn up much. It's not looking very hopeful.